From Captain Marvel and Wasp to Storm and Shuri, this beautiful book profiles dozens of aspirational female comic-book characters, all of whom use their intelligence, strength, kindness, and courage to help others and save the world. Fierce fan-favorites such as Gamora, Squirrel Girl, and Black Widow feature alongside lesser known faces from all corners of the Marvel comic-book universe. Young girls will discover modern, diverse heroes they can relate to and look up to, including America Chavez and Kamala Khan. 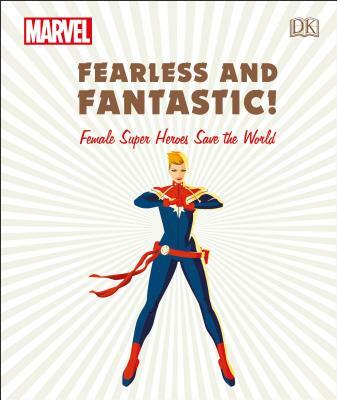 Featuring a foreword by Marvel Comics writer Kelly Thompson, DK's Fearless and Fantastic! is the ultimate tribute to Marvel's most powerful women and girls, and a treasured gift for comic fans. Illustrated with stunning comic-book artwork, and featuring inspiring quotations, each short biography is carefully curated to focus on the character's key abilities and achievements. With four chapters based on personal qualities-- Determined, Daring, Compassionate, and Curious--this book for girls and women of all ages will create new fans of comics, as well as inspiring comic-book creators of the future. Sam Maggs is a bestselling writer of books, comics, and video games. She's a Senior Writer for Insomniac Games; the author of Quirk Books' THE FANGIRL'S GUIDE TO THE GALAXY, WONDER WOMEN, and GIRL SQUADS (October 2018); and she's written for comics like STAR TREK and JEM & THE HOLOGRAMS. A Canadian in Los Angeles, she misses Coffee Crisp and bagged milk.